I’m busy working on corrections and alterations to a new book Robins and Chats of the World. 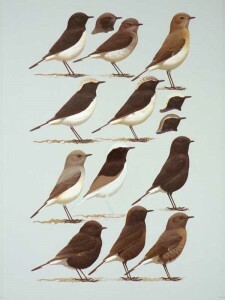 This is plate 45 featuring Variable wheatear (Oenanthe picata) and I’ve just blocked in the last figure – a first year male of the race or form capistrata, for those who are interested in such things! There will be 64 plates like this illustrating nearly 150 species from around the world. I’ll post the finished figure shortly, when I’ve had a cup of tea! The top centre figure is the one I’ve just finished. 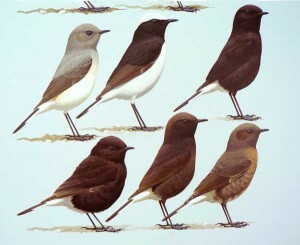 To the left of it is the female and the remaining figures are of the race opistholeuca.